For some shoppers, having a package left at their home is preferable to trekking to a faraway depot that's always busy, but Facebook neighbourhood groups and news broadcasts are often reporting on thieves caught on home security cameras stealing packages left outside. Todd Bailey is fed up with delivery companies that drop his online purchases at his door. A few years ago, the Grande Prairie, Alta., resident was at the hospital for the birth of his child when a big-screen TV he had ordered was left on his front stoop. Bailey figures the enormous box, a target for would-be thieves, was there nearly 24 hours. The frequent online shopper has been repeatedly frustrated that expensive purchases have been left unattended rather than transported to a safe location like a post office. "It's not the first time but it still surprises me when you come home and there's a big package on your doorstep out there for everyone to see," Bailey says. "I think the assumption is it's being delivered to a person and not to an address. The assumption is it's being delivered to go inside the house." For some shoppers, having a package left at their home — especially if it's placed in an inconspicuous spot — is preferable to trekking to a faraway depot that's always busy. But Facebook neighbourhood groups and local news broadcasts are now frequently reporting on thieves caught on home security cameras stealing packages left outside. Last week, Bailey tweeted a photo to Purolator of a box left against his door. It was a Christmas gift from his mother for his seven-year-old son. "It's almost too easy [for a thief]," he says. "It just boggles your mind." In response to his tweet, a customer service representative for Purolator replied: "Our delivery service requires a signature, however, if the sender selects the signature-not-required service, and there's no risk of it being stolen or damaged, we'll honour it." There are no easy answers for consumers who are victims of theft. In an email, a Purolator spokesperson said "the receiver should notify local authorities. They can also file a claim with Purolator." Canada Post and UPS Canada both say shoppers should contact the retailer. FedEx Canada did not respond to an interview request, but a page on its website invites customers to file a claim if a package is lost. Amazon.ca shoppers are told — if they read the legalese in the site's conditions of use — that "risk of loss and title for items purchased from Amazon.ca pass to you upon our delivery to the carrier or, if such items must cross an international border, then risk of loss and title pass to you when they clear customs." Amazon added in a statement that "the vast majority of deliveries make it to customers without issue. In the rare case something occurs, we work with customers directly to make it right." The Seattle-based company thinks it has solved the problem with its new Amazon Key product, which allows a customer's door to be wirelessly unlocked to accommodate a delivery. A camera records the drop-off to protect against anything inappropriate and the door locks as soon as the delivery is complete. The service is not yet available in Canada. Canada Post spokesperson Jon Hamilton agrees that package theft is still "a small issue that gets a lot of attention," but could not provide any figures on how many complaints the organization receives. While he acknowledged it does happen, he notes the volume of parcel deliveries is at an all-time high. 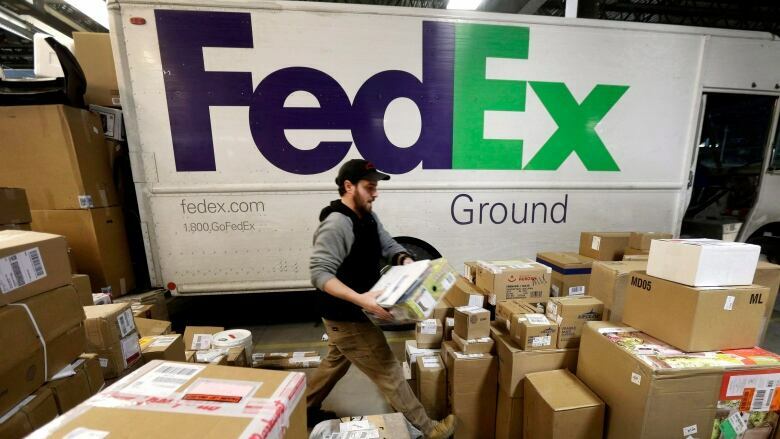 "What we have right now with [holiday] online shopping is we're delivering over one million parcels a day across the country," says Hamilton, noting the postal service hit that daily marker 60 times this year. He invites shoppers who are afraid of theft to use Canada Post's FlexDelivery service, which allows online purchases to be directed to a post office for pickup. But some Canada Post locations have been overloaded by packages being stored for online shoppers. On Friday, there were six across the country that were jammed full and unable to accept any new deliveries. "The one part of the process we can't control if a parcel goes to a post office is when people will pick it up. About 80 per cent of the parcels that are dropped off at a post office get picked up within three days and there's about 20 per cent that will linger," Hamilton says. "And at this time of year when more and more parcels are arriving every day with online shopping, that can add up." He added that one major retailer's recent sale on the Instant Pot created havoc with Canada Post's network, given how large the cooking devices are. "[We] were chock-a-block with Instant Pots ... so you can imagine how that could eat up a lot of space in a short period of time." Bruce Cran, president of the Consumers' Association of Canada, says e-commerce is still in its relative infancy, so it's not surprising that there are inefficiencies in the delivery process. He also believes that on a percentage basis, the number of packages being stolen is small. "Consumers love the convenience and at the moment, I don't think there's an immense danger in people looking to take deliveries," Cran said. "I don't get the impression at the moment that it's anywhere near the quantity that would prevent us from utilizing these services. We value being able to order on Thursday night and maybe get it on Friday morning."